I presented the following during the clinic. The greatest benefit of this page is the links to on-line references and the 11 rules to start TT&TO operations. I’m not a professional railroader, instead I’m a model railroader who believes that bringing a model railroad to life through prototype based operations is lots of fun. Honestly, I’ve only operated with TT&TO on sessions I’ve setup on my Sn2 SR&RL (dismantled in 2006) and a friends HO PAR&NCo. These are small model railroads, but still worthy of operating. I’ve obtained most of my knowledge by reading model railroad publications and a few prototype publications. So all credit to this clinic goes to those who have shared their information, thanks. Below is a list of references to get you started too. The list is not comprehensive. “How to Operate Your Model Railroad” by Kalmbach publishing. Published in 2012 is a special issue of operating articles. It includes many from Andy Sperandeo’s “Operators”. However two of Andy’s latest cover the communication be between dispatcher and operator. These two are not included. So keep reading the operators. I will say, it is nice to have so many articles in one place. Introduction to TT&TO: Identify the tools of TT&TO and explain setup of TT&TO on Jim Stewart’s PAR&NCo. Running a train under TT&TO: To train the clinic attendee for his first TT&TO job – Conductor or Engineer of a train. The training is via an interactive presentation, not provided in these notes. 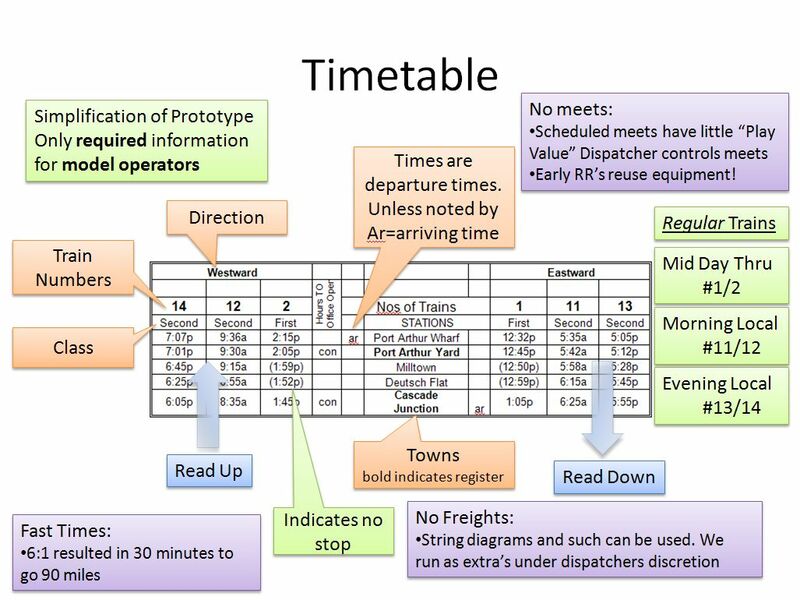 Time-Table and Train Order: Time-Table = schedule of Trains and Train Order = Means to make adjustments to the schedule. This clinic is about the Movement of Trains only. Specifically by the means of Time-Table and Train Order (TT&TO). Why TT&TO for a Model Railroad? If you want to watch “day’s of our lives”, stay at home. Some rolls/trains are easier than others choose a role that suits you. Run an passenger train for ease. Run a local extra for challenge. Properly applied crews do not write things down. Only the Dispatcher and Operator(s) write. Sign up to run a train. Calculate the travel time between each town. Adjust the times for the fast clock ratio you plan to use. Use the time between to towns to calculate the times in the time table. Extra trains are not included in the time-table. For the PAR&NCo. 6:1 was choose because passenger trains and a complete railroad day occurs in under 3 hours (up to 18 hour railroad day). Digitrax – A 3rd party loco net clock is available, I’m not sure if any throttles can display. Free-ware on computers – Clocks are available for the computer, but to my knowledge they only support singe display of computer. Future – I predict computer driven clocks will appear on wireless phones (along with throttles). Above is the physical time-table. On the PAR&NCo. we post the time table along with help on reading the time-table for the following information. This is created in Excel but any word processing tool with tables would work. PAR&NCo. timetable sheet. This single page include critical information related to time-table. Extra’s may be run daily. Circumstances often cause them not to meet a schedule or run to a schedule. Extras get their rights from the train order. Extras are exciting, crew must navigate the railroad dodging the schedule trains. The dispatcher protects them and keeps them from falling too far behind. One of the most important points for a crew to remember: “Time table gives a train 12 hours rights, so trains can run late…It’s OK” Make safe choices. On the PAR&NCo crews are provided a Guide as follows. I Try to make it a single page that a crew member can fold and put in their back pocket. The dispatcher will issue train orders and must transmit and record them as prescribed by the rules. The orders are issued to augment the time table. Orders are issued by writing them in the Train Order book and then dictating the order to the operator. Larger layouts may benefit in having a phone between DS and Operator, and the PAR&NCo, it is not required. Operator(s) are not decision makers. Decisions are made by the DS and crews. The operator is a communicator. This is a low pressure job for those who do not want to work hard. PAR&NCo. 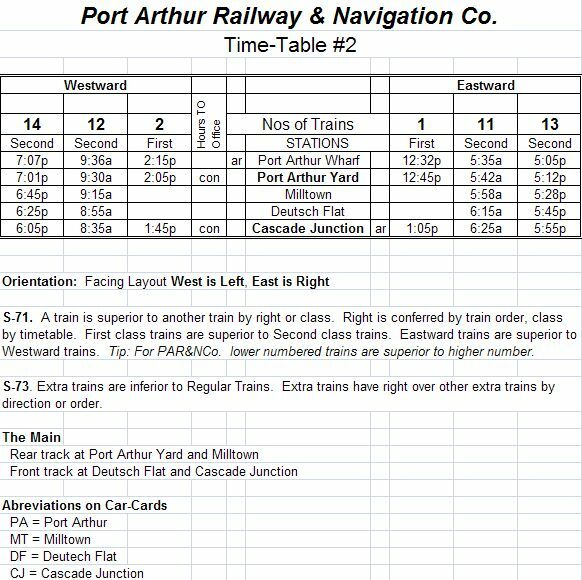 Train Order Sheet. Most real railroads had books of these sheets. A three ring binder could be used to make a book. PAR&NCo. Dispatcher’s sheet. This sheet is used by the dispatcher to track trains on the railroad. Model railroad owners may replace this sheet with a magnetic board. The advantage of the paper form is that there is a record of what occurred. 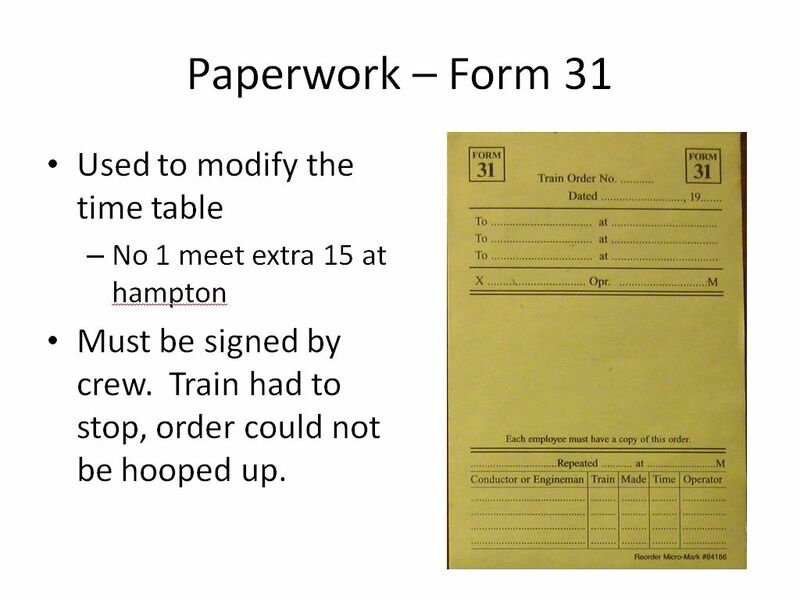 Form 19 is the most commonly used train order paper form. The form at left is from the Operations Road Show (2005 NMRA national convention) the form at right is from the micro mark. 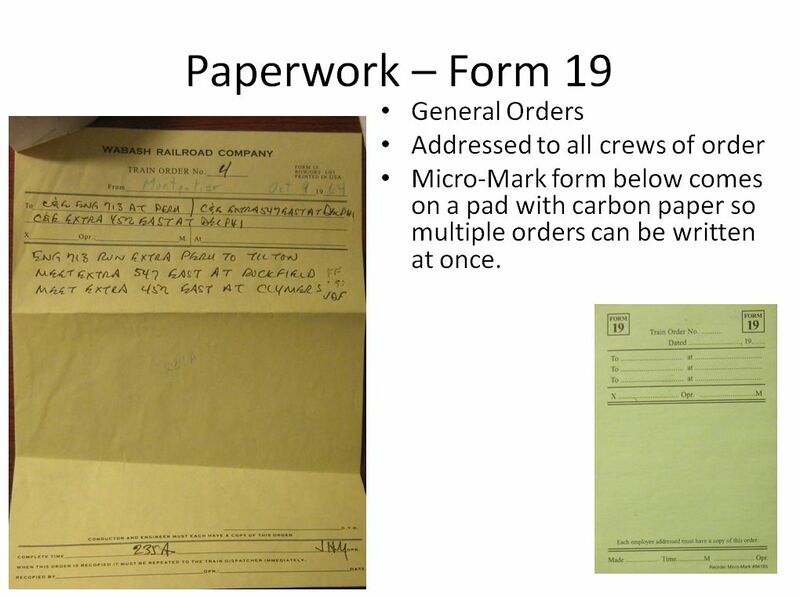 The micro mark forms come with carbon paper so that copies can be made for multiple crews. Micro-mark Form 31. Again, these come with carbon paper. Train register are reviewed by crews to assertain if they can depart. In TT&TO it is the crews responsibility to verify that all superior trains have arrived and left. The PAR&NCo. uses registers at each end of the railroad. Sample train register from PAR&NCo. An extra is working Milltown and wants to know when the next train is coming through town. Real railroads have employee time-tables. This is a single booklet (4.25×11″) that was required to be on employee. It contained all rules of the railroad. One can find them for various railroads on Ebay or included in some publications or from historical groups. These are very valuable in understanding how a specific railroad worked. May model railroad have employee time-tables too. I find them hard to use for new crew members. It’s hard for the newbe to comprehend all the newaunces and identify what is “critical” to the assigned job. As such, the PAR&NCo. uses guides for each job (as shown above). The guide is a one page document that an employee can read and digest and reference as they break in to a specific job on the railroad. I suggest having employee time tables as your crew advances. They are a cool to model! All railroads followed a common code. Even the narrow gauge railroads. Many employee time tables only contain the railroad specific deviations from the code. The code contains information rules of communication, order writing, signaling, etc. S-71. A train is superior to another train by right, class, or direction. Right is conferred by train order, class by timetable. First class trains are superior to Second class trains. Eastward trains are superior to Westward trains. 73. Extra trains are inferior to Regular Trains. Extra trains do not have right over extra trains except by train order. Regular trains are those in the time-table. 82. Time-table schedules, unless fulfilled, are in effect for twelve hours after their time at each station. The time-table is “ideal” time but is seldom achieved by all trains. Take your time, be prudent, be safe. It’s not a race! S-83. Stations at which train registers are located will be designated by timetable. A train must not leave a register station until it has been ascertained whether all trains due, which are superior, have arrived or left. S-83a. 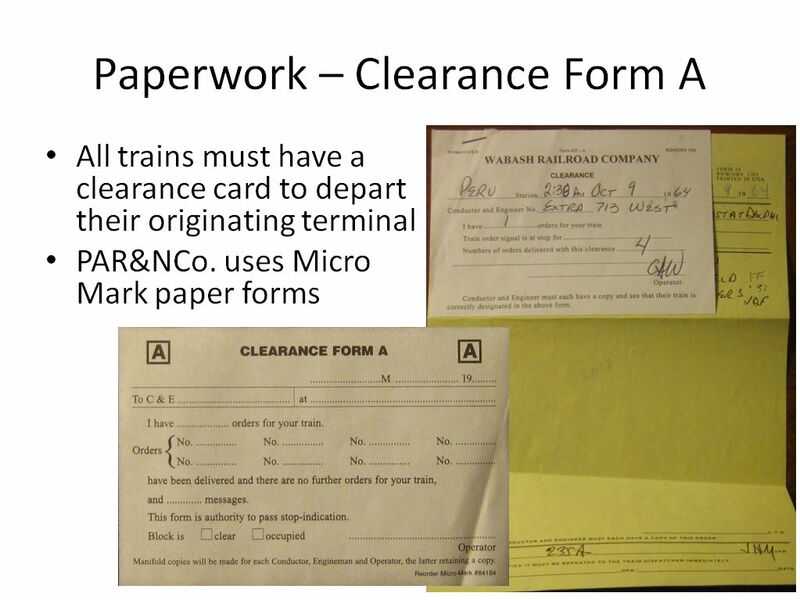 A train must not leave its initial station without a train order or clearance card. 97. Unless otherwise provided, extra trains must not be run without train orders. Regular trains must have a clearance card. Extra trains must have a clearance card and a train order. 86. Unless otherwise provided, an inferior train must be clear at the time a superior train in the same direction is due to leave the next station in the rear where time is shown. S-87. An inferior train must keep out of the way of opposing superior trains and failing to clear the main track by the time required by rule must be protected as prescribed in Rule 99. Extra trains must clear the times of opposing regular trains not less than five minutes unless otherwise provided and will be governed by train orders with respect to opposing extra trains. S-88. At meeting points between extra trains the train orders must specify superiority of trains or indicate train responsible for being in the clear. 92. A train must not leave a station in advance of its schedule leaving time. 93. Within yard limits, the main track may be used without protecting against second class trains, extra trains or engines. In Yard limits just clear first class trains. This clinic was just a teaser. There is much more out there to learn. This entry was posted in Operations, TT&TO. Bookmark the permalink.